Business Image, an event planning firm in Macon, is sponsoring “Conversations of a Poet” on April 30th. This is described as a “Poetic Glam Slam” experience and will allow poets to bring focus and attention to the art of the spoken word, showcasing their talents while awarding a prize of $200 based on audience preference. The MC will be Marquis “Que” Norton. The event will also include vendors, live entertainment, and food and drinks in an upscale décor at Theatre Macon, 433 Cherry St, from 6-9 PM. Artists and poetry connoisseurs are welcome and the affair will be black-tie with a strictly enforced dress code. Tickets are $15 on Eventbrite or $20 at the door. Donations are welcome and appreciated and can be given through the Eventbrite portal. 100% of the funds collected will go to the artistic participants. Guests are requested to being their printed ticket to the event to present at the door and early arrival is encouraged as the doors open at 5:30 PM. 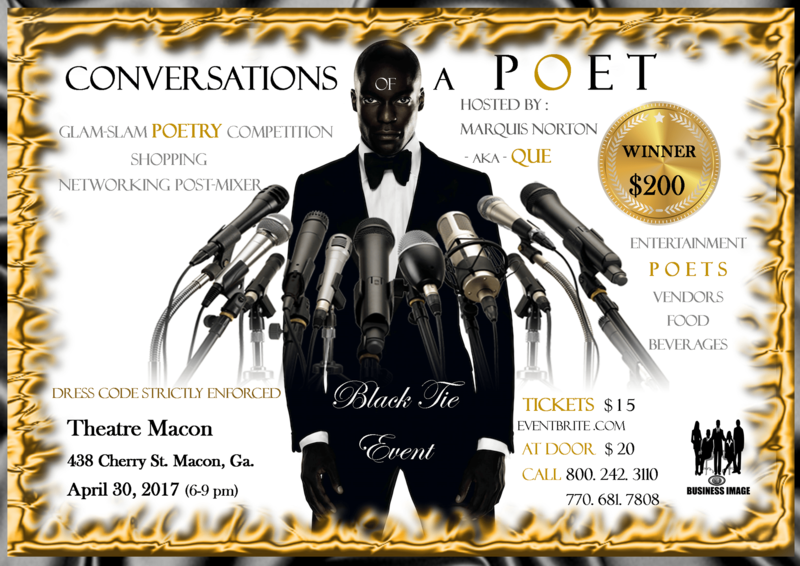 Announcements can be followed on Facebook and questions can be directed to email at businessimage.exec@gmail.com or call 800.242.3110.
Business Image presents “Conversations of a Poet”, a black tie event at Theatre Macon on April 30 at 6-9 PM. Image courtesy Business Image. Why: Because culture, the Arts and Great Literary events are vital to every community.